The newest release from Spring Fed Records is a set of home recordings made by music icon banjoist John Hartford and fiddling legend Howdy Forrester. 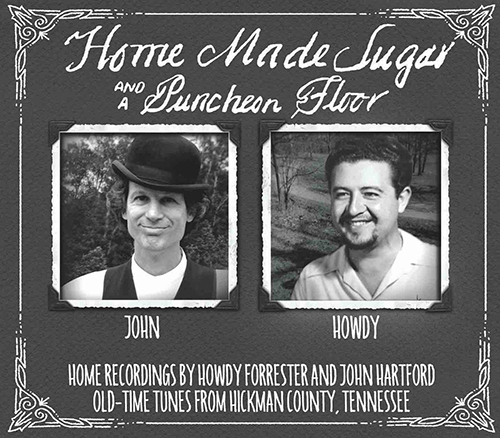 Home Made Sugar and a Puncheon Floor is a collection of 20 previously unreleased performances of rare old tunes that Forrester learned as a boy from his great-uncle Bob Cates in Hickman County, Tennessee. Hartford plays banjo, Forrester fiddles, and the two share informal discussion about the tunes and their sources on the record. Before Hartford passed away in 2011, he made many visits to the homes of traditional musicians, always recording their conversations and jam sessions. Some of these musicians were little known, but others, like Forrester, were quite famous. The original tape is part of the Charles K. Wolfe Collection in the archives of The Center for Popular Music (CPM), one of the nation’s largest and richest repositories of research materials related to American vernacular music and part of MTSU’s College of Media and Entertainment. Dr. Greg Reish, the CPM’s director, co-produced the CD with Spring Fed label manager John Fabke. CPM audio specialist Martin Fisher handled the digital transfers, and MTSU recording industry Professor Michael Fleming did the final mastering. A release party for the project took place Jan. 14 at the Inglewood American Legion Post #82 and featured local musicians Jim Wood, Tracy Latham, Inge Wood, Andy Todd and Ben Ayers with special guest Jamie Hartford. To see them perform “Fiddler’s Dream” at the event, click here. Spring Fed Records is the GRAMMY-winning label acquired by The Center for Popular Music from the Arts Center of Cannon County in 2014. To download Home Made Sugar and a Puncheon Floor, please visit the Spring Fed Records website by clicking here.